One&Only Palmilla’s old-world Mexican elegance combined with postmodern luxury has made it one of Cabo’s most iconic hotels. Located on the tip of Mexico's Baja California Peninsula between the towns of San Jose Del Cabo and Cabo San Lucas, One&Only Palmilla is set within the region known simply as Los Cabos. The Resort is part of a collection of award-winning properties, receiving numerous honors internationally. All accommodations offer 24-hour shared butler service and patio or balcony facing the sea. On land and sea, One&Only Palmilla is a recreational paradise featuring two dramatic infinity-edge pools, a swimmable beach, a plethora of dining options, an elegant spa with private treatment villas, and a signature Jack Nicklaus designed 27-hole golf course. The options are endless at One&Only Palmilla. Located in Casa Playa and Casa Sirena, single level beach front junior suites with dramatic private infinity-edge pools directly on the beach on a raised platform offer panoramic views of the Sea of Cortez; sitting area, deluxe pool terrace with daybed, terrace chairs and side table for in-suite dining and private entertaining; marble bathroom; rain shower; over-sized bathtub; twin vanity sinks. Available with a King-size bed. Swaying palms surround these ultra-luxurious accommodations, located in Casa Mañanitas. Available with one king bed. 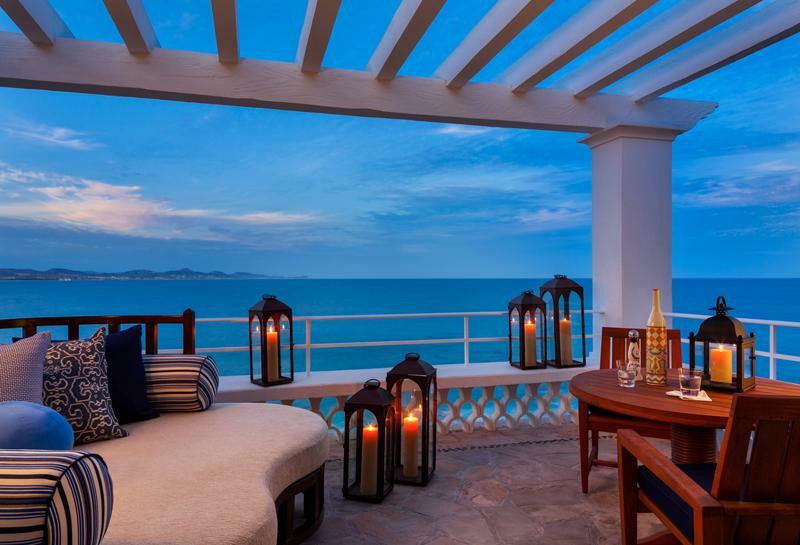 Located in Casa Margaritas and Casa Mananitas, these premier suites offer magnificent views of the sun rising over the Sea of Cortez. . Available with a king bed. For the ultimate in luxury there are the suites located in Casa Gardenia, Casa Colores and Casa Miramar. Offering 1,400 square feet of stylishly opulent living space. Available with one king bed. A one of a kind masterpiece which captures the true feeling of coastal luxury living. Located in a secluded area on the South side of the resort directly on the beach, Villa Cortez includes four bedrooms; private spa facilities; 12-person private screening theater; infinity-edge pool and Jacuzzi and full interior and exterior kitchens along with outdoor fire pits. Guests find inspiration in the villa's leather paneled home office; full gym; outdoor rain shower and comfortable live-in butler facilities. Two bedrooms featuring king-sized beds and two bedrooms with two-queen-sized beds per room. 10,500 square feet. Located in Casa Arena and Gardenia, these junior suites feature large beach front patios that are ideally designed for outdoor entertainment and include a personal plunge pool. Each patio is also appointed with a daybed for afternoon siestas and evening star gazing, while the interiors are resplendent with handcrafted Mexican elegance. Magnificent views of the Sea of Cortez provide a scenic backdrop from every area of the suite, including the bathroom, which features a sculptured bathtub with rain shower. Available with one King-size bed. For the ultimate in luxury, these suites are located in Casa Gardenia and offer a resplendent 130m² (1400ft²) of stylishly opulent living space. Available with one King-size bed. Located on the highest point of the resort, this spectacular four-bedroom Villa, with an additional Butler Suite, offers dramatic sweeping views of the property and the Sea of Cortez. 492 m² / 5,300 ft² of interior space, 896 m²/ 9,650 ft² of exterior space. Villa One has spacious living spaces with large glass doors that connect to outdoor terraces allow for a true indoor outdoor experience. Glass, infinity-edge pool, surrounded by chaise lounges and a palapa with a hanging day bed. Upper courtyard breakfast terrace with seating for eight. Dining terrace with kitchen and seating for twelve. Lower terrace with sunken fire pit and built-in seating perfect for entertainment. 660 sq. ft. available in a King-size bed or two Queen-size beds. Pools & Beaches: The resort's original infinity-edge pool is located adjacent to reception overlooking the beach. Vista Pool is for adults only and features flowing waterfalls and a swim up bar – the perfect place to relax in a serene atmosphere and enjoy the warm Mexican sun. A second infinity-edge pool is perched on a bluff overlooking the sea near Agua Bar which offers a light menu throughout the day. Aptly named Agua Pool, this tropical oasis with waterfall and a meandering river also features a dedicated children's pool making it ideal for both families and couples. Floating beds / Day cove experience From 1 to 5 guests/Fee usage does not not include meals or beverages. Agua Mexiterranean Restaurant Adjacent to the resort's infinity-edge pool with stunning views of the Sea of Cortez, Agua features the renowned 'Mexiterranean' cuisine of our award-winning Executive Chef Larbi Dahrouch. The restaurant's palapa-style design with indoor and outdoor seating offers a more casual alternative to Market, the resort's upscale, formal restaurant overseen by renowned Chef Jean-Georges Vongerichten. Open for breakfast, lunch and dinner. Attire: Breakfast & Lunch Casual: T-shirts or polo shirts, shorts or jeans, sundresses or skirts. Bathing suit cover-ups and shoes are required. Dinner Resort Upscale: dress T-shirts or polo shirts, dress shorts, slacks or jeans, sundresses or skirts and similar apparel. Bathing suits not permitted. Boutique At One&Only Palmilla's boutique guests gain exclusive access to the world's finest resort wear collections. All collections in the boutique are exclusively chosen for One&Only Palmilla. Many finds in the boutique are limited editions or one of a kind pieces providing the ultimate reminders of your visit and offering you the best mix of local crafts and international designer collections for your memories of One&Only Palmilla. In addition to highly sought-after labels such as Matthew Williamson, Stella McCartney, Christian Louboutin and Ferragamo, arts and crafts pieces, including Alfonso Castillo's Trees of Life, Mata Ortiz ceramics and Mexican hand embroidered linens are available. The boutique is an inviting place to shop and socialise, housing an eclectic mix of artwork and sculptures throughout the space. Market Fine Dining Restaurant by Jean-Georges Vongerichten Legendary restaurateur and Michelin-starred Chef Jean-Georges Vongerichten presents a unique dining concept in Market, his first outpost South of the Border. In understated elegance, Market features Euro-Asian cuisine with Mexican inspirations along with the country's most complete wine list. Designed with an understated elegance of warm natural colours and original artwork, Market brings to life Jean-Georges' French roots with Asian influence to reflect his travels in the region and the freshness and variety of Mexico's rich culinary tradition and ingredients. Open for dinner daily, reservations suggested. Resort Elegant attire. Private Spa Treatments Renowned as Mexico's premiere destination spa, the One&Only Spa at Palmilla offers an expansive programme of ancient healing techniques combined with cutting-edge therapies. Pampered guests choose from a rich menu of Massage Therapies, Wellness Experiences and One&Only Palmilla Signature Rituals for an unrivalled journey of personal rejuvenation and renewal. Follow a meandering path through tropical gardens to a hidden door opening onto a secluded private villa. Each of the 13 private treatment villas offers a beautifully appointed air-conditioned massage pavilion and open-air garden. Double villas are designed to share the experience with a friend or loved one, and many include rain showers, Mexican day beds and whirlpool baths as well as private vanity. At One&Only Spa, every detail is an important part of the experience and every sense is indulged, from the rituals that accompany each treatment to the exclusive premium natural products using the finest ingredients. Our team of highly skilled ESPA-trained spa professionals have been handpicked to deliver optimum results in every treatment. Adjacent to the resort’s infinity-edge pool with stunning views of the Sea of Cortez, Agua by Larbi features the renowned ‘Mexiterranean’ cuisine of our award-winning Executive Chef Larbi Dahrouch. The restaurant’s palapa-style design with indoor and outdoor seating offers a more casual alternative to Market, the resort’s upscale, formal restaurant overseen by renowned Chef Jean-Georges Vongerichten. Evenings at Agua are always memorable, with the moon reflecting on the water and serenading musicians setting the mood for a festive meal. The restaurant's decor, including vibrant red and yellow glass mosaic walls, blue and white patterned tiles accenting everything from a grand fireplace to the tables and a cluster of colorful Moroccan lanterns hanging over the Agua bar and lounge, is one of the highlights of this seaside eatery. There are also traditional Mexican touches such as custom-designed ceramic tableware from Guadalajara and a trickling fountain anchoring the restaurant’s courtyard terrace. A stunning glass-enclosed kitchen allows guests to watch Chef Larbi and his team perform their culinary magic. And magic it is, with appetizers such as a Roasted Medley of Vegetables “Tortita” with Picholine Olive Tapenade and Sautéed Foie Gras served with Blue Corn Polenta and a Red Wine Grenache Reduction. Entrées include signature dishes such as Tagine of Lamb served with Artichokes, Sundried Tomatoes, Goat Cheese and Raz Alhanout Sauce and Grilled Veal Chop served with Plátano Macho “Estofado” (stew) in a Black Mole Sauce. Agua by Larbi’s menu is complemented by a diverse wine list that showcases Mexico’s many undiscovered wines that make up 60% of the list. Breakfast & Lunch Casual: T-shirts or polo shirts, shorts or jeans, sundresses or skirts. Bathing suit cover-ups and shoes are required. Dinner: Resort Upscale: dress T-shirts or polo shirts, dress shorts, slacks or jeans, sundresses or skirts and similar apparel. Bathing suits not permitted. 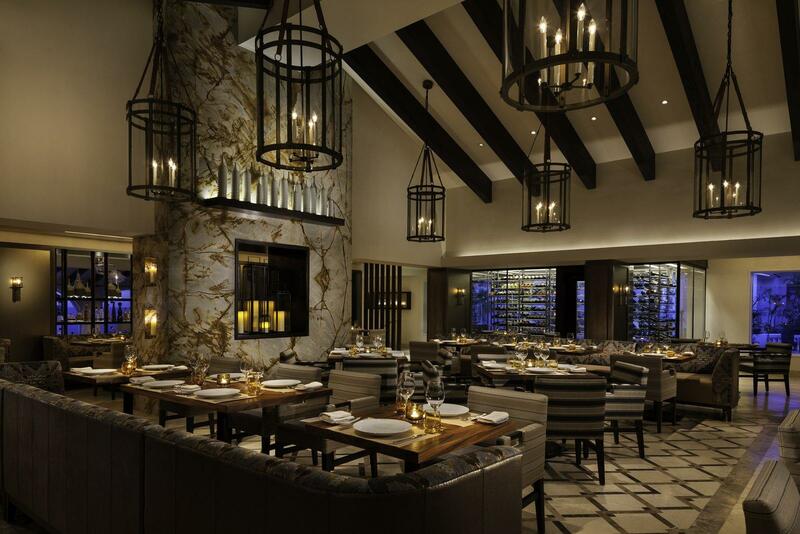 Michelin-starred chef Jean-Georges Vongerichten has collaborated with One&Only Palmilla since 2008. The new restaurant SEARED by Jean-Georges under the direction of Executive Chef Sebastien Agnes offers an array of steaks choices including Kobe Tomahawk, Grass Fed NY Strip and Porterhouse all displayed in a glass-walled meat cellar with a dry-edge curing room. The new menu also highlights the best of the fish and seafood from the Baja as well as some of the Chef’s favorite signature dishes. The restaurant offers an understated elegance of warm natural colors and accented by original Mexican techniques designed by Jeffrey Beers. The design features an entranceway encased in amber glass, amber chandeliers, tawny marble with candlelit nooks and Aztec geometric marble floors. The new steakhouse can accommodate 102 guests in the main dining room and 40 on the new outdoor terrace. Open for dinner daily, reservations suggested. Resort Elegant attire. The perfect setting for lunch or light afternoon snack, this alfresco venue overlooks Vista Pool and the Pacific Ocean beyond. This outdoor terrace café, also created by Jean-Georges Vongerichten, features everything from quesadillas to cevichés to a variety of sandwiches and salads. The menu offers a continental blend of favourites and tropical libations. Attire Casual: T-shirts or polo shirts, shorts or jeans, sundresses or skirts. Bathing suit cover-ups and shoes are required. Suviche offers an impressive selection of fresh Sushi and Ceviches in a unique combination of traditional preparation with Jean-Georges' signature blend of flavors and ingredients. The al fresco casual and fun ambiance is complimented with the scenic views of the Sea of Cortez and live entertainment. One&Only Palmilla is located at the southernmost point of Baja California along the Pacific Ocean and the Sea of Cortez within the Los Cabos Corridor, a 21-mile stretch between San Jose del Cabo and Cabo San Lucas. There are ample direct flights from numerous U.S. gateway cities to San Jose Del Cabo International Airport, and the resort is a 20-minute drive along the Carretera Transpeninsular Number One Highway.